Grapefruit and weight loss go together. The grapefruit diet which has recently grown in popularity is not a new diet fad; it has its origins in the 1930s. The renewed interest in the diet developed after studies proved that women who ate the fruit had smaller and thinner waistlines than those who didn’t and it helps lose weight. The diet works on the principle that eating the fruit before meals help fill you up. You thus end up eating less or fewer calories for the meal. 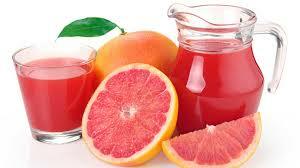 The original rules of the diet were to eat half a grapefruit or 8 ounces of 100% grapefruit juice before each meal. Breakfast consisted of two eggs and two bacon slices, lunch consisted of unlimited protein of your choice with salad and dressing and dinner, meat or fish and vegetables. You then drink a glass of skim milk or tomato juice at bedtime. The new and improved grapefruit diet has some changes. With breakfast being the most important meal of the day, both fruit and protein are required to feel fuller with fewer calories. However eating some other fruit, soup or beverage is enough for lunch or dinner as they also fill you up. According to the diet, you have to eat half a grapefruit as part of a calorie controlled, high-protein breakfast every day. Generally about 20 grams of protein consisting of fewer than 400 calories is just right. If you’re not a grapefruit fan you could always eat a medium orange, half a medium banana or 2 kiwifruit instead. Then eat a serving of fresh fruit or a cup of broth-based soup, vegetable juice or 16 ounces of water before lunch and dinner. Your mid-am and afternoon snacks should consider of fruit or veggies and your lunch and dinner should be balanced meals. So typically, the following menus should help get you started. 1. Day One: Breakfast should include a cup of coffee or tea, ½ grapefruit and 2 eggs or 2 slices bacon. Lunch should include chicken, lean beef or fish, a salad and a cup of coffee or tea. Supper should be broiled fish, salad and a grapefruit. 2. Day Two: breakfast is the same as day one, and a sugar substitute can be used for coffee or tea. Lunch could be a cup of coffee and a fruit salad and supper, cooked vegetables with lean beef patty but no bread. 3. Day Three: Breakfast is as day one and two, lunch could be a grapefruit and a tuna salad and dinner, salad, lean beef or pork chops and coffee. 4. Day Four: Breakfast is the same while lunch can be a cup of coffee, squash, 2 eggs and cottage cheese. Supper could be coffee, spinach and lean beef or grilled or broiled chicken. 5. Day Five: Breakfast is the same, lunch could be some dry cheese and spinach while supper could be some cooked vegetables, coffee and fish or chicken. Of course, all these menu ideas are just suggestions. You can get an idea of combinations as you progress with the salad. Generally eat large amounts of meat and vegetables but coffee or tea and grapefruit consumption should be the same.